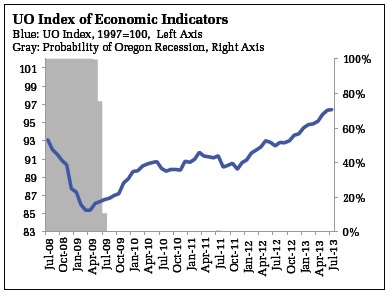 • The Oregon Measure of Economic Activity rose to 0.20 in July from an upwardly revised -0.05 the previous month. The three-month moving average, which smooths month-to-month volatility in the measure, stands at 0.18 where “zero” for this measure indicates the average growth rate over the 1990-present period. • High levels of hours worked in manufacturing, although down a bit in July, still make a significant positive contribution to the measure. Housing activity is stronger, and now is only a mild negative weight on the measure, but construction employment growth remains slow. 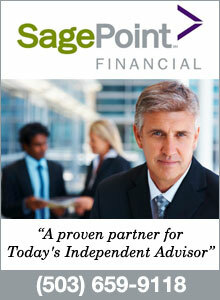 As the sector continues to improve, additional hiring should follow. • The University of Oregon Index of Economic Indicators™ rose 0.1 percent in July; the UO index has not decreased since September 2012. Initial unemployment claims edged up but signal continued job growth. • Employment services payrolls, largely temporary employees, rose and are now 8.8% higher than year-ago levels, suggesting improving economic conditions are prompting firms to explore adding additional workers. • Residential building permits (smoothed) edged down but and have been hovering in the 1,200-1,300 range for four months. Core manufacturing (nondefense, nonaircraft capital goods) orders slipped while the Oregon weight-distance tax, a measure of trucking activity rose.